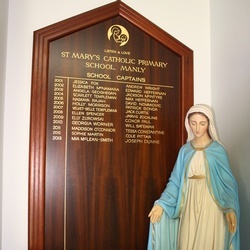 It is important that when our students leave St. Mary’s they are able, amongst other things, to feel confident and independent through the leadership role opportunities in the school. Every Year 6 student has the opportunity to fulfil an important leadership role in the school. The staff and fellow Year 6 classmates support each other through their school roles to allow them to grow in independence and confidence. A system of regular class meetings generates topics of interest. Selected class members then meet with the School Captains and Principal to ‘share wisdom’ and to prepare advice for consideration by the school’s leadership team and staff.